James Madison was the 4th President of the United States of America, the symbolic leader of the country. His presidency began in 1809 and ended in 1817. He was 57 years old when he first began his term of office on March 4, 1809. 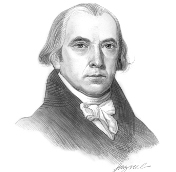 James Madison was the second cousin to Zachary Taylor who became the 12th US President. He inherited the family name and was named after his father and called 'Jimmy' as a child to avoid confusion. He had a variety of nicknames including Father of the Bill of Rights, America's First Graduate Student, Jemmie, Little Johnny, Father of the University of Virginia. Many of the nicknames referred to his diminutive stature as at only 5 feet 4 inches, he was the shortest person to serve as a US President. The picture of James Madison portrays an interesting image of what this famous man looked like. The picture shows the clothing and the hairstyle that was fashionable during his presidency. He is the shortest of all the presidents, his height was 5 feet 4 inches, and he had a small build weighing about 100lbs giving rise to the nickname "Little Johnny". He had blue eyes and wispy brown hair with a somewhat sallow complexion. Unlike his predecessor, Thomas Jefferson, he took great care with his appearance, wore expensive clothes, often black, and created a dapper image. Character and Personality Traits: What was James Madison like? The personality of James Madison is described as a shy introvert who was uncomfortable with people he did not know well. He felt at a disadvantage due to his small size - he was unable to create an imposing or powerful impression. He was an intelligent, meticulous man, who pondered over issues at great length, which allowed his critics to describe him as indecisive. One he had made a decision he was firm and adamant in the way he followed it through. His work resulted in the nickname "Father of the Bill of Rights". The important role and duties of the President of the United States of America include those of Chief of State, Chief Diplomat, Chief Executive, Commander in Chief, Legislative Leader and Leader of his own political party. What was James Madison famous for? Why was James Madison important? The history and life of President James Madison during his presidency is conveyed in the following fact file in an easy question and answer format. What President was James Madison? He was the 4th President of the United States of America. The dates of his presidency began in 1809 and ended in 1817 (March 4, 1809 to March 3, 1817). What other political offices did James Madison hold before his presidency? What was James Madison' nickname? Who was James Madison' s first lady? James Madison was famous for the events and accomplishments of his presidency, but what are the facts about the man and his private life. Facts and information about the private life of James Madison can be found in the following fact file in an easy question and answer format. When and where was James Madison born? Where was James Madison educated and what was his religion? What did James Madison do before he became President of the United States? Who was James Madison' wife and when did they marry? Did they have kids? When did James Madison die? We hope that the picture, facts and information on President James Madison will prove helpful to kids, school children and schools learning about the presidency of this famous American leader. The facts about James Madison provides an overview of the President's character and personality traits. Watch the video and learn more about the major events of his life and his accomplishments. The following James Madison video is a useful educational resource for kids, children and schools learning about the life of the US President James Madison.